For earthquake relief in Nepal, connection is key. Displaced Nepali citizens found themselves unable to connect with organizations to provide essential needs, like food, water, and medical aid. Accountability Lab is dedicated to making this connection possible. 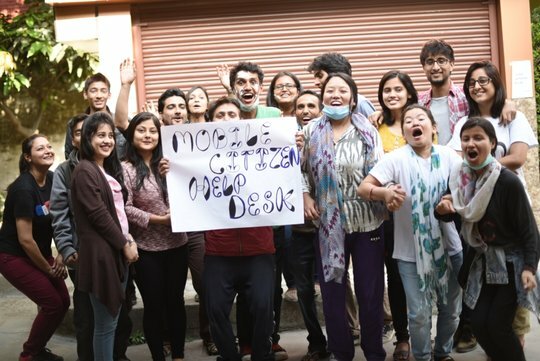 At GlobalGiving, we were fortunate enough to get in contact with Narayan Adhikari, the representative for Accountability Lab: South Asia, and gather a bit of look into what is happening on the ground in Nepal. Through their Mobile Citizen Helpdesk project, Narayan and Accountability Lab have been able to visit over 65 communities and directly solve over 100 problems for citizens. Last month, we conducted this interview with Narayan over email. GlobalGiving (GG): Tell us about the situation where you are right now. Narayan Adhikari (NA): I am in Nepal now, working with 32 Citizen Helpdesk volunteers. Despite huge tragedy, the helpdesk volunteers have been working around the clock to visit places where people have sheltered, hospitalized and displaced. I am also working with other Citizen Helpdesk partners, the government of Nepal, and the donor community to consolidate everyone’s efforts to provide assistance to the people on the ground. GG: What is the most urgent need facing survivors? NA: Not enough tents for shelter, rescue operation are predominantly limited to urban areas and their peripheries, while many families from remote district have been left out from receiving the support they need. Food supplies are very limited in many remote villages. The aid agencies are facing huge challenges to coordinate with one another and conduct needs assessment for proper and fair distribution of relief. GG: What kinds of assistance are you providing to survivors? NA: We are visiting the affected areas with the help of our volunteers, collecting information from direct interaction with victims, listening to their problems, helping them obtain appropriate information, and connecting them with relief organizations and the government. We are also working with the government to assess their data received from citizens through the mobile hotline 1234, where more than 25,000 voice calls have been received directly from citizens. GG: What’s the biggest challenge you’re facing in delivering aid? NA: One of the biggest challenges is getting the right information about the disaster. The media reports and government data are frequently not available. Other key challenges in the aid delivery are: lack of coordination among relief organization and government; unequal and unfair distribution of relief packages; difficulty reaching the most affected areas in remote districts. We are working to help alleviate these challenges as much as possible. Our biggest challenges is quickly raising the funds needed to roll this project out as far as possible. GG: What do you believe the long-term recovery needs will be? NA: More mobile helpdesks are needed to assess needs and gather feedback from the local people. The information should be shared with government and aid agencies, and these stakeholders should manage relief efforts with strong and efficient routes to reach affected households and individuals. The current mechanism of budget allocation and disbursement is a very slow, lengthy, highly corrupt, and overly political process, and it is not going to solve the problem at all as long as we are not able to create short-cuts for the current disbursement mechanism (i.e. from center to household without any intermediately). Individual households need to be provided with enough support with technical skills, proper materials and labor to sustainably re-build their homes. There has to be citizen oversight to monitor relief and make sure it is utilized in effective ways. GG: How long do you expect to be working on relief and recovery efforts? NA: At least 2 years. Even as we transition back to our other accountability programs, earthquake relief and the accountability of the aid system will continue to be a key issue and component that they cover. GG: How does the situation compare to other disasters you’ve responded to in the past? NA: We have not experienced anything like this before in Nepal. The other key country that Accountability Lab works in is Liberia—which just faced the deadly Ebola crisis last year. That it was a very different sort of crisis, and our response there focused more on creative awareness campaigns. However, in both situations we had to mobilize quickly, find ways for citizens to get involved in improving their community, and try to build trust between citizens and their government. Both have affected all aspects of the country and will have long-term repercussions. GG: From your perspective, are relief efforts well-coordinated between the various NGOs and government responders? NA: Not really, and that is part of the reason why we’ve set up the Mobile Citizen Helpdesks. With better coordination between NGOs and government, the people would can get better quality support, sooner. GG: What about the situation currently in Nepal do you think most people may be unaware of? NA: People are traumatized and are full of fear. Many people, especially from affected communities, do not have any idea what to do and have not been able to get reliable information and direct channels to raise their voices. GG: What are the advantages that a local NGO has over an international NGO? vice versa? NA: Local NGOs are more connected with the locals and understand the situation better than INGOs. Thus they have more human capital and contextual understanding, while INGOs typically have more financial resources. GG: What about Nepal specifically makes responding to this earthquake a unique challenge? NA: Nepal hasn’t had local elections in 18 years so there is very little accountability in the local government, which has an important role to play in distributing aid. There is systemic corruption and a highly inefficient bureaucracy in the government that has delayed Constitution making for years, and is in many responding similarly to the disaster. Furthermore, given Nepal’s poor economy, a huge number of Nepalis work abroad, thus leaving a gap in an important work force. On the other hand, Nepal has a very active youth and civil society population that have risen to the challenge in many ways. The relief effort in Nepal is far from over. Narayan and the Accountability Lab team are continuing to work tirelessly to provide more connection and information to the citizens of Nepal. With the continued kindness and generosity of the GlobalGiving community, you can help make the Mobile Citizen Helpdesk network even stronger. You can donate to Accountability Lab here on GlobalGiving. For us in DC, life is back to normal. Spring is here and although I couldn’t quite make myself go view the cherry blossoms this year – associated as they are in my Japanese mind with celebration – it’s hard not to feel all revved up at the prospect of warmer weather, longer days, and days off. And this year I feel keenly that it’s a luxury to feel this way. Because for people in Japan, life is full of reminders that it’s not back to normal. Aftershocks continue, as you can see here in a map covering just the last week, and my mother tells me you just can’t get bottled water in Tokyo ever since the radiation scare that started 22 days ago. And people in the Tohoku area are mourning the 25,000+ people who were killed or are still missing, more likely than not at an evacuation center – for there are still more than 170,000 registered at the official centers. Then there are still others, official numbers unknown, who are squatting in buildings they were able to reach and take shelter in. It’s required extraordinary efforts to keep a semblance of normalcy together in Japan. One of our project leaders has been just buying fuel, shipping it into Japan, and distributing it to people to power their kerosene stoves to stay warm. It’s not a long-term solution by any means, but it’s badly needed. To help with these efforts, and thanks to more than 30,000 donors and dozens of companies, GlobalGiving and GlobalGiving UK have disbursed more than $3 million to 14 organizations: Architecture for Humanity, Association of Medical Doctors of Asia (AMDA), Association for Aid and Relief (AAR), Civic Force, International Medical Corps, Japan Platform, Japanese Emergency NGOs (JEN), Lifeline Energy, Mercy Corps, Peace Winds, Save the Children, Shelter Box, Shine Humanity, and Telecom for Basic Human Needs (BHN). The International Medical Corps has partnered with local organizations to provide telephone counseling and training in psychological first aid. To support these ongoing relief and rebuilding projects you can head over to our Japan Earthquake and Tsunami landing page. Others have begun to develop long-term plans for recovery. Architecture for Humanity is committed to the physical rebuilding of communities, while Telecom for Basic Human Needs has developed a plan for reestablishing radio infrastructure in collaboration with Japan Platform. You can see – and support – these specific projects on GlobalGiving.org and GlobalGiving.co.uk. Over the next month or two, we’ll be channeling the funds that are still coming in from corporate matching campaigns, cause-marketing promotions, and individual donors. On our blog you can read more about how GlobalGiving’s corporate partners are contributing. And in the UK, GlobalGiving UK’s partnership with JustGiving continues to provide an easy way for individuals and corporations to fundraise for disaster relief projects. Ocado, the home delivery company, used JustGiving’s platform to raise £200,000 from staff and customers for Mercy Corps’ work via GlobalGiving UK. For more real-time updates on our work, you can follow us on Twitter (@GlobalGiving) or “like” our Facebook Page. And updates from the field are all on our “Updates from Japan” page.